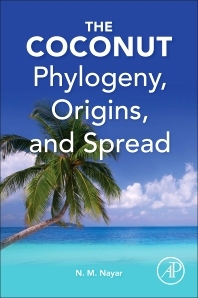 The Coconut: Phylogeny, Origins, and Spread comprehensively covers the botany, phylogeny, origins, and spread of the coconut palm. The coconut is used primarily for its oil, fiber, and as an article of food, including its tender-nut water. Until the 1950s, coconut oil used to rank first in the world in production and international trade among all the vegetable oils. Since then, lower-cost sources such as the African oil palm, soybean, canola, and others have overtaken the coconut in oil production and trade. The coconut, Cocos nucifera L. (Arecaceae), is a dominant part of the littoral vegetation across the tropics. In addition to discussing the origins of the coconut and its use as a crop, the book covers the resurgence in the use of the coconut in food, pharmaceuticals, and nutraceuticals. Chapter 10. Afterword: Does the Coconut Have a Future?